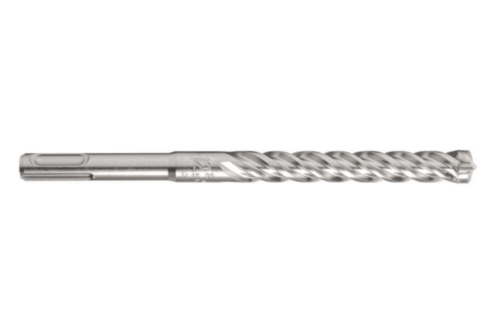 The connection of the new, innovative, intelligent geometry with its uncompromised quality of detail ensures a long service life, precise drill holes and unusually quiet running - even on the toughest loads., Ø 5-16 mm: Thanks to the optimum symmetrical head geometry with 4 full carbide cutters, the drill runs with extremely low vibrations and does not catch when encountering reinforcing. The one-piece full carbide plate is optimally embedded in the steel body using a maximum joining surface. This way, head and spiral form a unit - especially when it needs to compensate impacts and torsional strength. Furthermore, the special head geometry creates spherical drill holes and thereby remains dowel-suitable at maximum tool life., Ø 18-32 mm: Three-piece carbide element: The innovative, unique carbide cutting geometry and the large, robust subsidiary blades arranged in an optimum 4 x 90° symmetry prevent catching on reinforcements and ensure perfectly round drilled holes. The centring point and the wear simple, accurate piloting and the evaluation of measured dowel holes. The genuine 4-spiral helical geometry distributes the loads optimally on all spirals, thereby attaining low-vibration drilling characteristics. The four large-volume conveyor coils quickly remove the drill dust from the drill hole. The high-quality special steel makes the drill extremely robust and the resistance is further increased by the special surface treatment. It drills up to 50% more dowel-suitable drill holes than other drill hammer bits. For professional use in the hardest natural stones, concrete, masonry.